Skit!, the comedy animation app that TechCrunch first met at Disrupt NY, is ramping up its monetization strategy with sponsored product placements. 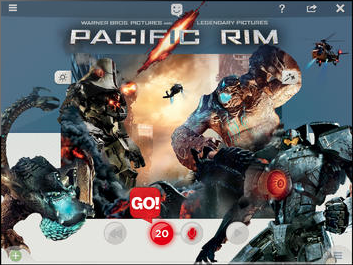 The latest one is timed to Pacific Rim’s Blu-Ray release on Oct. 15 and lets you insert monsters and other characters from the campy blockbuster into your own send-ups (or loving tributes). Skit! is currently available for iPhone and iPad, with an Android version in the works. Based on technology by Adobe, Skit! makes it easy for you to turn photos of yourself and friends into animated characters, insert them into backgrounds, add costumes and props and record voiceovers, all with a few swipes of your fingers. The latest update to Skit! added social elements, including profile pages and the ability to follow other users and leave comments on their animations. Skit! was created by former Electronic Arts animation technical director Robin Johnson and Max Woon, a founder of Xfire, an instant messaging service for gamers that was acquired by Viacom in 2006 for $102 million. After leaving Electronic Arts, Johnson helped launch Trilogy Studios, a mobile app maker that created interactive storybooks based on titles such as Harold and the Purple Crayon, Despicable Me and Ladybug Girl. While working on those projects, Johnson got the idea for Skit!. Johnson began his collaboration with Woon, who had also been conceptualizing a storytelling platform. The duo got into Techstars, where they worked on Skit! from January to April. Then the team was accepted into Warner Bros. Media Camp, an incubator for media startups, where they spent the summer at Warner Brothers studio fine-tuning the app. Skit!’s monetization strategy centers on partnerships with companies that want to engage with audience beyond the usual social media outlets. Instead of just distributing content for fans to like or retweet, Skit! lets them insert branded characters and props into their own skits. Users are encouraged to share videos, furthering the brand’s reach. Previous promotions included a tie-in with the Mad Max franchise, also distributed by Warner Brothers. “Skit! has developed an innovative, viral, simple and fun way for fans to interact with their favorite content and share with their friends. We are excited to leverage this platform to help drive awareness and broaden our reach in a highly effective way,” John Attanasio, the Vice President of Global Marketing for Warner Home Entertainment, said in an e-mail. Johnson says other marketing possibilities for Skit! include product placements–for example, a bottle of hot sauce that steams up when it’s dumped on food (or someone) or clothing that can be used to dress-up characters. Upcoming features include more fun ways for characters to interact (such as shoving each other), as well as real-time storytelling features that will allow users to collaborate on animations. Skit! is currently closing a seed round of funding.